Alluring, adorable, astonishing. 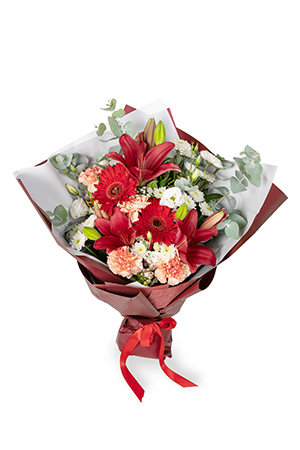 There is Colour all round in this fascinating mixed bouquet of seasonal flowers; Asiatic Lilies, Chrysanthemums, Gerberas, and Tulips. There has never been a more appropriate description "a lovely bunch of flowers, suitable for any occasion," - hence the name.Lilies may be sent closed/partially closed in order to prevent damage and to last longerVase not included, however if you would like to make your flower gift extra special, we suggest including a Premium Vase to leave a lasting impression. I loved that you reminded me to send flowers for my daughters birthday. Very easy!! Bouquet was beautiful, delivery flawless and wife delighted !!! I woke up this morning with a photo of the flowers I sent to my daughter who is living and working in New York on my phone with a great big Thankyou! It made me very happy! Very efficient and lovely flowers arrived on time.